This Saturday morning just gone, my copy of ‘Beer’ dropped on to the door mat, and due to rigourously enforced exclusion zones, didn’t get shredded by the dog. I like ‘Beer’, and clearly others do too – Pete Brown finally joined CAMRA last year because it’s the only decent magazine available on the topic on these shores. But it was ‘What’s Brewing’ tthat accompanied it that struck me most. ‘Triumphalism’ is too strong – but it’s not far off. The front page: ‘Growing Cask Ale Sales Inspire Confidence’; page 5, an ad for SIBA Beer X, ‘British beer is thriving as never before’… it’s a vein that’s been showing through the skin more and more in recent months. There’s a warm glow emanating off brewers and cask drinkers up and down the line. a) Now is not the time to be opening a new brewery if you have any ambition of scale. The honeymoon but will be lovely but give it a year or two and you’ll be struggling for sales. b) Behaviour has changed. Beer is no longer recession proof because it’s no longer the default thing we do when we socialise. Breweries need to face the new – repertoire – reality. c) I intend to enjoy as many interesting beers up and down the land before the next round of consolidation. So am I? Am I missing something? Author David PrestonPosted on January 25, 2013 Categories ObservationsTags Cask beerLeave a comment on Am I missing something? Just like the Black Country has pork scratching and Lancashire has Black Pudding some places are defined by certain foods – in a curious circularity, as originally the place had defined the food. Pasties – Cornwall; Barm Cakes – Manchester; Stotties – the great North; Eel Pie – Larndon. And there was my idle mind granting these British foods a divine uniqueness – quaint old Blighty, only here do we have these regional peculiarities. Nonsense of course; a point driven home to me when an entrepreneurial ex colleague sent me some beers that his company is bringing in from the U.S… Wisconsin in fact. Ah, Wisconsin. As a beer lover a source of perpetual confusion. Isn’t it the beer capital of the US (by volume brewed)? In the great city of Milwaukee? No, hang on, that’s Minneapolis, and that’s Minnesota. Nonetheless, Wisconsin is a food state. In fact, for many US citizens it’s the food state, certainly in terms of capacity produced. So I engaged in some primary research, and asked my friend Dan now resident back in the US to give me his top of mind associations when I say ‘Wisconsin’. Of 26 associations he came up with 3 of the first 5 were food related: ‘Curds’, ‘Black and White cows’ and ‘Bratwurst’. And there, down at number 7 was ‘beer’. Which about sums it up: the holy trinity of food stuffs; a perfect blend which would sustain you, and entertain you, through a nuclear war, assuming the electricity doesn’t fail and the fridge doesn’t pack in. It turns out that first and foremost, Wisconsin is a dairy state – so much for the degree in geography. Milwaukee vs Minneapolis – an easy mistake I reckon. But beer more than features –and not that long ago it featured big time in the economic make up of this state. Because for a while, a beer that came out of Wisconsin was one of the US’s biggest beer brands* – Schlitz. But that’s not what Mark’s importing, oh no. No, travel north from Milwaukee to Green Bay, and then head due west to the small city of Stevens Point – and there you’ll find the Point Brewery (http://www.pointbeer.co.uk/). A city, which, if the labels are in any way accurate, is where the Coneheads settled after the fame and success of the 1993 movie (http://www.imdb.com/title/tt0106598/ …in case you think I’m making this up too). Mark isn’t doing things by halves. Why import one beer, when you can import five? And that was the rather pleasing late Christmas present that arrived on my doorstep just after the New Year. It’s an interesting range: ‘standards’, if you will – an IPA, a Pale Ale and a Belgian White, and two more unusual ones – an Amber Lager, and a Black Ale. The quality of the beers is high – of course it is, the quality of US craft beers is so high that the poor performers get rooted out, but some stand out more than others. Possibly the most disappointing – versus expectation – were the Amber Lager and the Belgian White. The former because it is the most lacking – pleasant enough, more challenging undoubtedly than the lagers we typically drink here, but just not in the same ball park as the others in the range. The Belgian White, a good, well balanced white beer, but lacking in uumph – perhaps, too delicate, a little too refined compared with its peers. The Black Ale though is worth seeking out. A great structure and a clean, sail-white head. Whilst you can tell there’s roasted malts in there, the drinkability is retained. All too often in Black beers of all denominations, just a touch too most roast can tip the balanced into ‘charred’. Not here. All I would want is a more complex, sustained after taste – but I’m being picky. The IPA, a deep burnished bronze has an alluring, almost Seville Orange haze to it near the edge of the glass, and a clean, strong head. Clearly a relative of the Pale Ale, and to be sure, just like Jamie is eclipsed by Andy Murray, so too here. This Pale Ale is a cracker. To my eye, the right colour, a back lit copper, like a buffed up penny and a come-hither hop aroma, that calls you as soon as the cap is twisted off and continues through the pour. You can tell it’s Cascade hops a mile off, but unlike some US Pale Ales, not overplayed here – aroma, structure and a lingering aftertaste which beckons you for a second. Which, alas, I didn’t have. Mark and his team at American Craft Beer Co have just started out so the beers are only in limited stockists at the moment. If you’re in Birmingham, check out the Post Office Vaults, they’re on sale there and will hopefully be more widely available soon – watch this space. 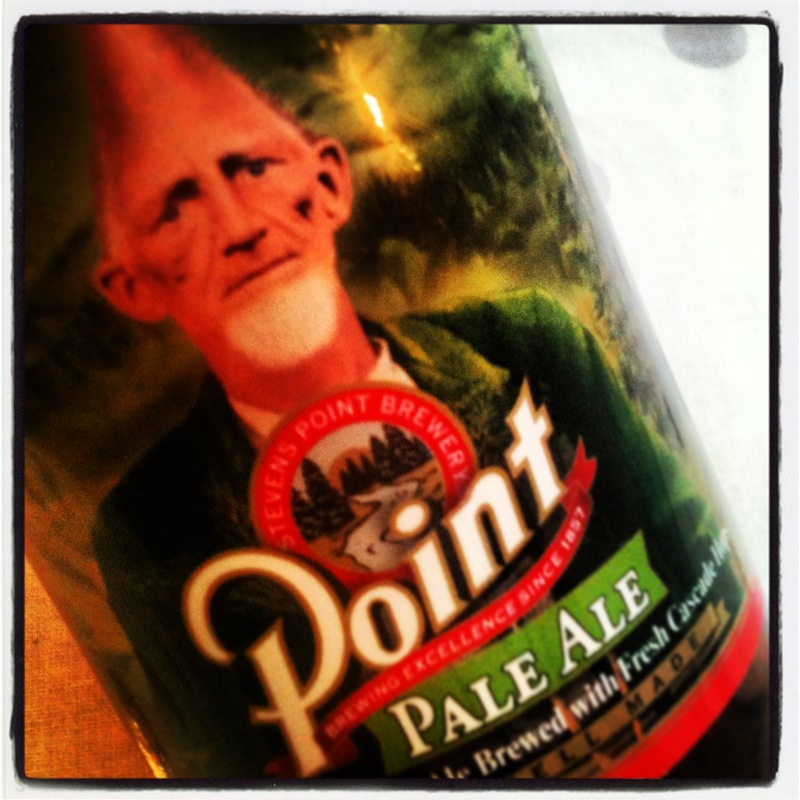 Which of course leads me to the food recommendation – what do I pair that Pale Ale with? A spicy meal perhaps – a jalfrezi or Thai Green Curry? Maybe some great English sausages – a richly herbed Cumberland? Do you know what, I think I’ll just go for some cheese – semi hard, West Country Cheddar. Not sure why. *I sold Schlitz in the UK in the early ‘90s. I’m sure I recollect part of the selling story was that it was once the largest brewer in the World, but I can’t say for certain.